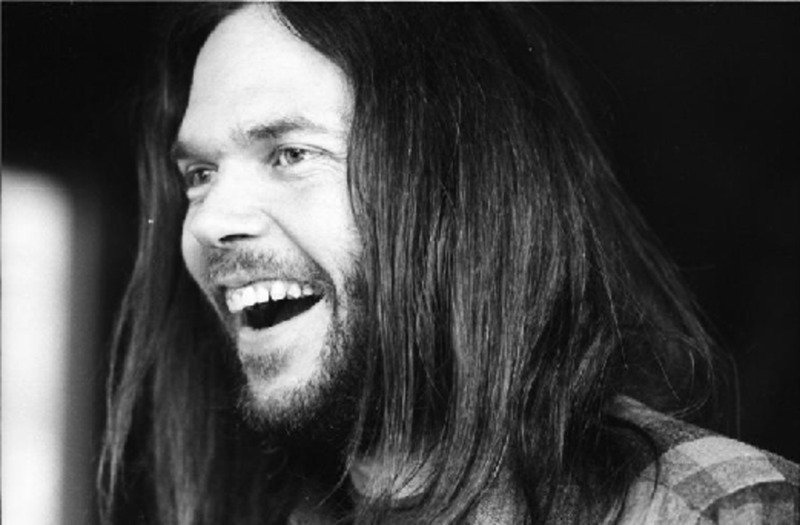 Neil Percival Young was born in the year of our Lord 1945 on the twelfth day of November, in Toronto, Canada. Since then, well, he's gone on to become one of Canada's favorite sons, a wonderful singer, songwriter, and musician. Neil began performing in 1960 at a tender young 15 years of age. He moved to California in 1966, and formed with some friends, a band which would become very successful, Buffalo Springfield. Of course everyone knows that later Neil would go on to be the sometimes fourth member of Crosby, Stills, Nash, and Young; a group which would record some of the most classic tunes in the canon of American music. As a solo artist Neil young is known for his highly personal lyrical style, and his vocals are very distinctive. Yes, he's recorded quite a lot of electric guitar music; but likely his acoustic guitar based songs are his best known. Albums such as Harvest are certainly what I always think of when I think of Neil Young. Neil young collects guitars, and has stated that he's fond of some odd cheap ones, but owns many Martin guitars as well. Neil and his guitars have sold quite a lot of records, and likely inspired many another musician to take up the guitar, the harmonica, and the pen. 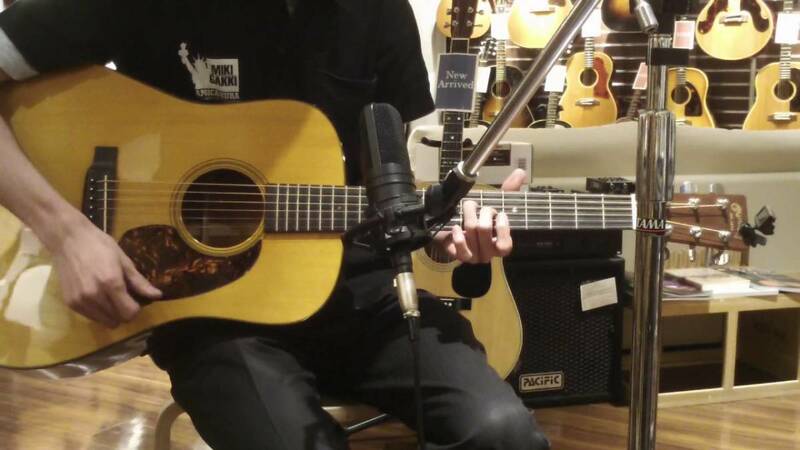 Neil Young's primary acoustic guitar is a Martin D-45. It's hardly his only guitar, and guitar isn't his only instrument. As the story goes, Neil received a ukulele from his father for Christmas in 1958; and this was his first musical instrument. 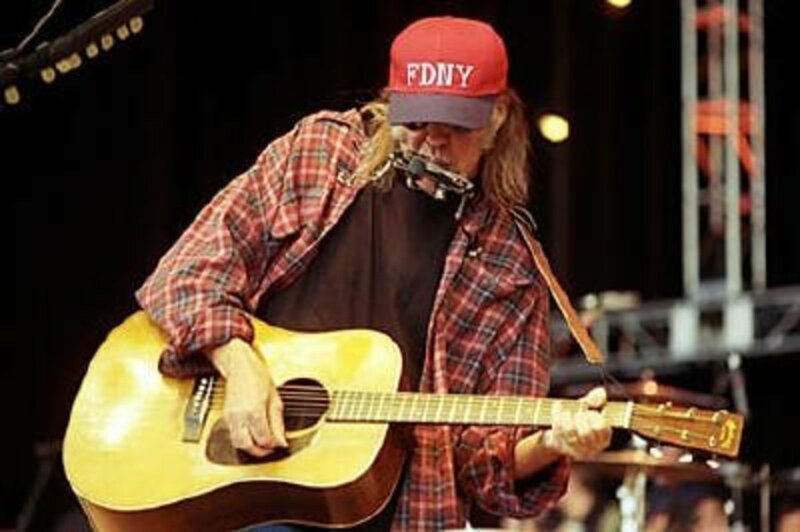 Of course Neil Young can afford all the guitars he wants; but primarily when playing acoustic guitar, he plays either a Martin D-45 or the exact Martin D-28 which had belonged to legendary country and western singer/songwriter star, Hank Williams. While it is amazing Neil, rather than someone in the Williams family, or the country music hall of fame wound up with the guitar, I'm pleased Neil has it. 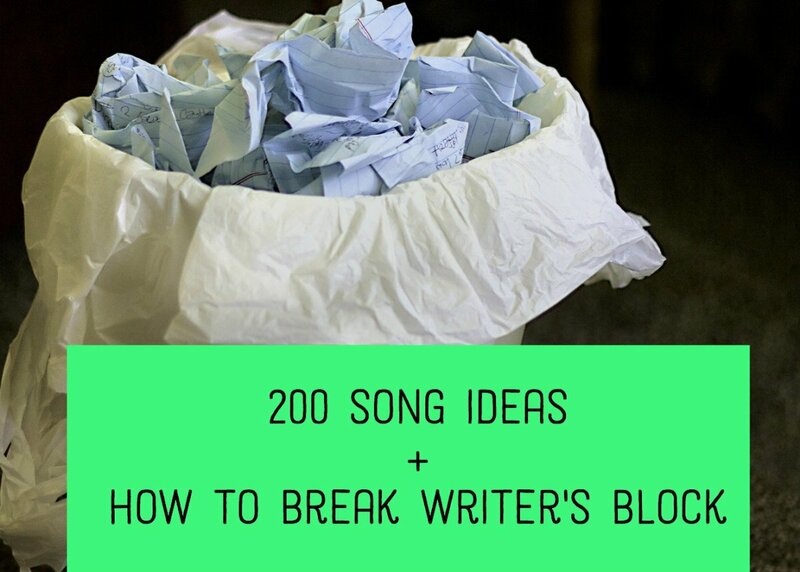 Hank Williams and Neil Young both are the sorts to write some similar types of songs insofar as emotions go. You can read about how Neil acquired Hank Williams' 1941 Martin D-28 here. Essentially the D-45 is only a more attractive D-28. The two should generally sound so similar that a blind person wouldn't be able to hear the difference between them. It's possible Neil plays one instead of the other due to sound. It's possible, but when you consider the emotional, sentimental, poetic person Mr. Neil Young is, it's more likely he attaches emotional significance to his instruments rather than sonic ones. Neil Young is a minimalist when it comes to his music. When playing acoustically he hardly needs any sort of band or backup, his highly distinctive vocals, guitar accompaniment, and harmonica can certainly carry any record or performance all on their own. 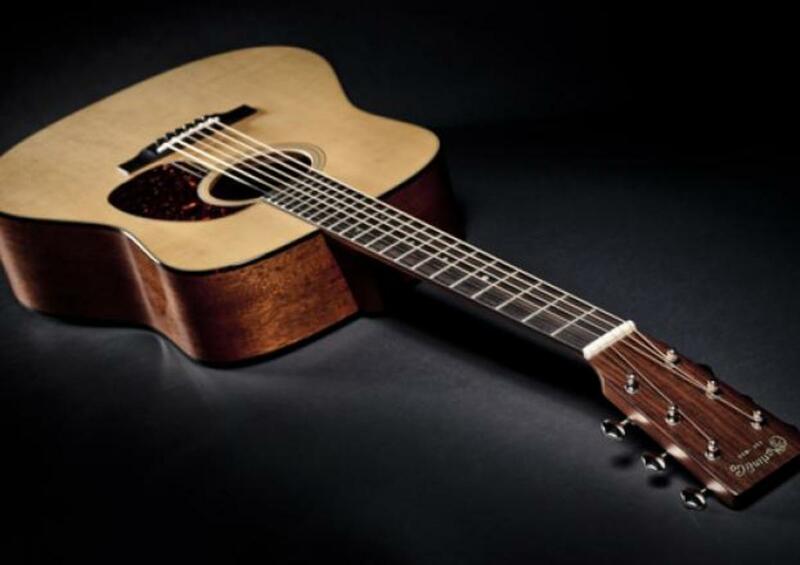 The martin 5-18 is a small twelve fret guitar typical of a style of instrument which was popular in the 1800's. It's a vintage series instrument, and one that will absolutely sound a lot different from a D-28 or a D-45. Joan Baez was extremely fond of this model guitar, as many another folk musician has been, including Neil young. The 5-18 is what is known as a parlor guitar. The '18' in the guitar's model number tells you the instrument is solid wood construction with mahogany body, spruce top, ebony fingerboard and bridge; but what it doesn't tell you is the neck of the guitar is pretty fat, it's a thick one and seven eights of an inch wide at the nut. It's a small instrument with a big sound, but it sure isn't cheap. As nice and as beautiful as are the Martin D-45 and the 5-18, for me, it's Neil Young's old 1941 D-28 which takes the gold for me. It's a guitar which has a heart of gold, and the sound to go with such a heart, so to speak. I'm in no way wishing for the demise of Neil Young; but it's going to be interesting to see where that particular guitar goes when he does pass away. Having belonged to Hank Williams, and then Neil Young, one has to hope that a phenomenal songwriter winds up with the instrument some day. That's what Martin guitars are all about, they just get better sounding as the years go on, and can be passed down generation after generation. 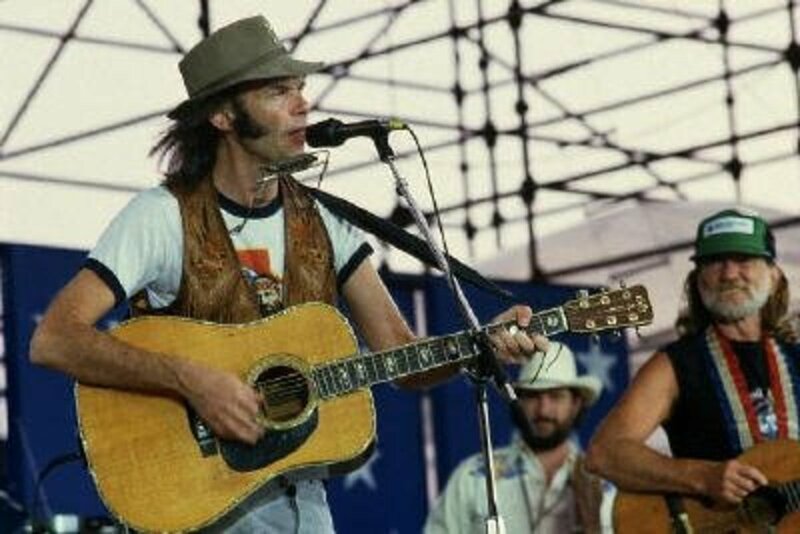 Neil Young, with Emmylou Harris, and Willie Nelson, Willie and Neil with their famous and old Martin guitars. Will there be a Martin Neil Young model guitar? According to Wikipedia's page about Neil Young, Neil used a Martin D-18 in his earliest years as a musician. Young used an old D-18 throughout his early days performing in coffee houses in Canada and on some early Buffalo Springfield work. I found a source which says Young's D-18 is a 1952 model. I've just not been able to locate a photo of Neil with the D-18, but likely there is one somewhere on the web. Neil's D-45 is still his primary acoustic guitar. The instrument was a gift from Stephen Stills, and what a terrific (and expensive) gift to have received. 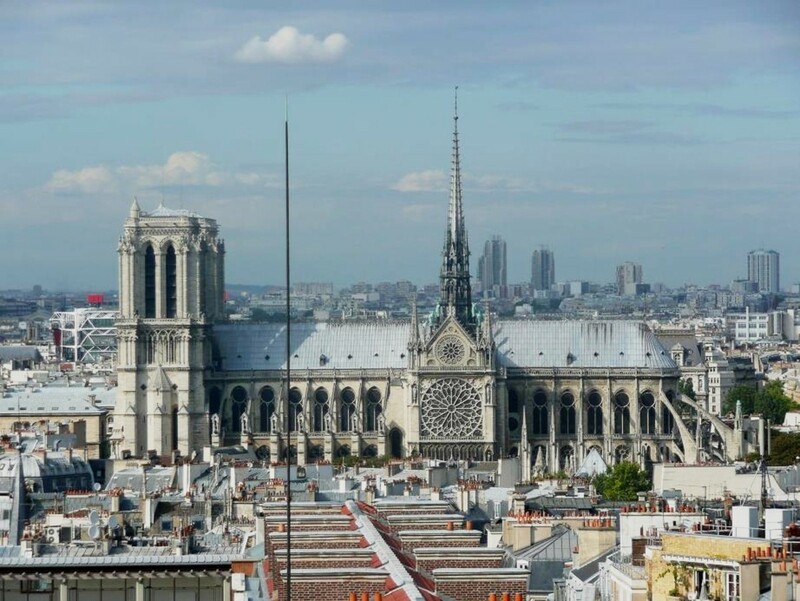 Neil was given the instrument in 1969, but I've not been able to find out whether or not it was new then, or was an older instrument. 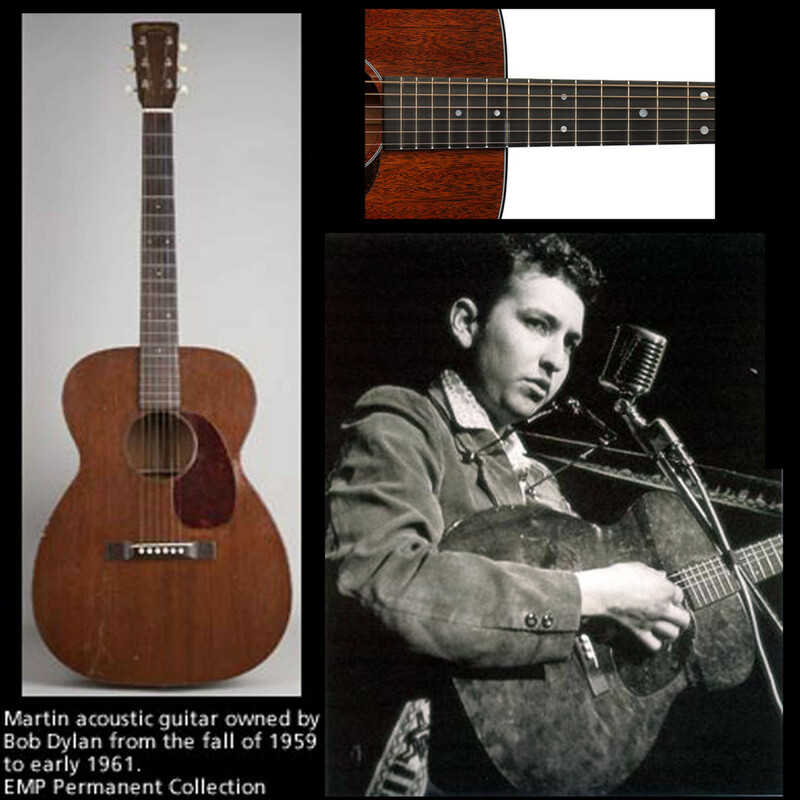 With all these fantastic Martin guitars which Neil Young owns and plays, the question has come up in places on the web, when will Martin make a Neil Young model guitar? Well, it's quite possible that Neil, being the modest sort of person he is wouldn't like the idea, but then again Neil Young is a very charitable man, and perhaps something could be arranged to where a Neil Young signature Martin is created, and some proceeds going to wherever Neil Young would have them go. We can at least hope for it, and for another fine Neil Young acoustic album soon. Thanks for reading. Hi, just an an FYI on the D45 and if it was new when he got it. I saw Neil at the Fox in St. Louis last night, 6/28/18. He told the crowd that the D45 was given to him by Stephen Stills when Stills was working with Martin on a Stills line of guitars. He said Stills eventually got the line and that he gave "everyone" one of the D45's and that he kept his. It was obvious that he really liked it. So it would seem a certainty that since the band all got one that it was new when he got it. I'm a massive Neil's fan since 2010. And surely I adore his works from early days in Winnipeg, Canada until the present-day albums (2010s and forth). 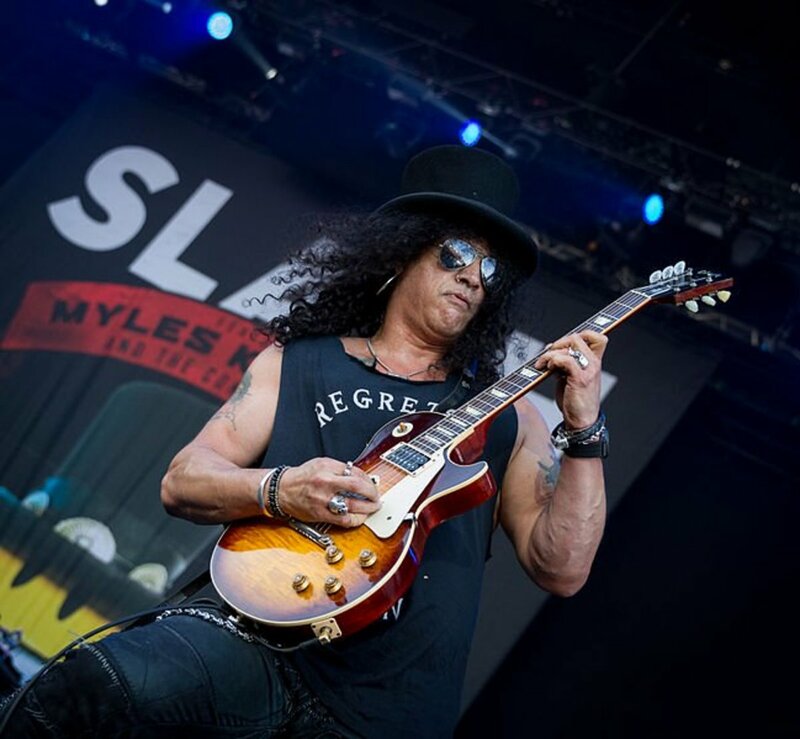 Loved his Martin guitars and the "Old Black" Les Paul! And hey if you noticed or have you got his Archives boxed-set; should you see his Martin D-18 in the back sleeve of the live album "Live at the Riverboat, Toronto, Canada, 1969). That's the legendary D-18. I'm a big Neil Young fan, he pours his heart out in his songs. I also like the way he tries new things. Did you read his autobiography, Waging Heavy Peace? It's really good, just like a conversation on the porch. He has some good songs he plays with Willie Nelson's sons, protesting against GMO's, but obviously having fun! My son also plays guitar, and he likes the distortion in the songs that really rock. I like the more "Harvest" stuff too. Spoon - thanks, I'll look into that. Thanks Hannah! I hope Neil puts out some new music soon. He's got so much soul that he can't make anything poor, music wise. RS - I think I got my info from the Wikipedia page. I do hope to do a full account edit soon, and clean up any errors. 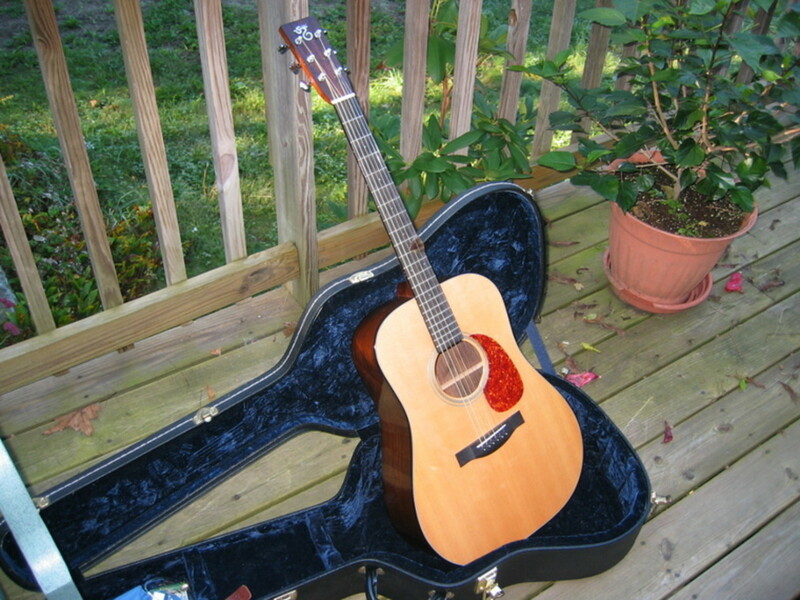 Neil's D-45 is a 1968 or 1969 model year as they brought the model D-45 back in 1968. Stills purchased it new and Young received it in 1969 so it could be either 68 or 69 year both of which were Brazilian Rosewood. 1969 being the last year production models were made from Brz Rsw. He is seeing playing it on a performance of Old Man recorded in Feb 1971 and looks like a brand new guitar so it is definitely not a pre-war model. Neil's D-45 is a 1968 or 1969 model year as they brought the model D-45 back in 1968. Stills purchased it new and Young received it in 1969 so it could be either 68 or 69 year both of which were Brazilian Rosewood. 1969 being the last year production models were made from Brz Rsw. He is seeing playing it on a performance of Old Man recorded in Feb 1970 and looks like a brand new guitar so it is definitely not a pre-war model. I loved this article. I have always been a big Neil Young fan but never realised he had Hank Williams guitar. I like your comment about Young possibly differing between guitars for sentimental value rather than sound. What a great article. That is not an 0-28VS! It is way too small. That is a size 5 "terz" guitar, so called because it was turned a third higher than normal guitars. Thanks Eddy! He's sure a great songwriter, and a very charitable man! A great tribute to such a talented musician. Voting up and sharing.